Are you ready to expand your travel horizons? Budapest, Hungary offers you a wide range of activities for both individuals and families. Whether you want to enjoy the city for a few days or perhaps a few weeks you can find fun, inspiring things to do in this enchanting spot. A visit to Budapest wouldn’t be complete unless you visit the Castle Hill and Royal Palace as this tourist destination finds a spot on the city’s skyline. You can’t miss the large green dome towering over the grounds. The National Dance Theater, Sandor Palace, the Budapest History Museum and the Hungarian National Gallery are all housed within this majestic building. A simple visit can inspire you to spend an entire day at this tourist spot. You can cruise up and down the rustic cobbled streets or perhaps you wish to enjoy some sweets and a warm cup of coffee at a local cafe. Whatever you decide to do take your time. Soak up the beauty of Budapest in one of the more special locations within the city. Take your time and cruise around for an evening or lovely afternoon. Budapest has built up a reputation for happening nightlife. Stop by the Jewish Quarter of District VII for the best night life scene in town. Walking around the neighborhood will get you to just about every top party spot to be explored. Don’t be shy; go on a foot patrol to scout out the best bars, restaurants and pubs. The ruin pubs are the real drawing point of this neighborhood. Try visiting during warmer months to take advantage of the outdoor party scene. You’ll be able to enjoy rooftops and garden bars more freely during the hot season. Make sure to visit adjoining districts as you may just happen upon an inviting pub or restaurant that falls a bit off of the beaten path. Explore freely to enjoy all that Budapest nightlife has to offer. Due to the rich thermal waters under Budapest you’re guaranteed a thermal bath treat in certain spots around the city. Let the day’s tensions dissolve by swimming in hot thermal waters at the Gellert Bath. Remember that these steamy waters means doing the outdoor pool bit year round in many spots. You’ll find a wide range of thermal baths from more chill, peaceful settings to party-type gatherings. Pick according to your preferences. If you’re a party-type who appreciates a steaming bath stop by Szechenyi Bath for its pool parties on Saturday nights. District V offers tourists a rich experience. From historic sites to stunning buildings you’ll be able to soak up the culture of Budapest everywhere you turn. 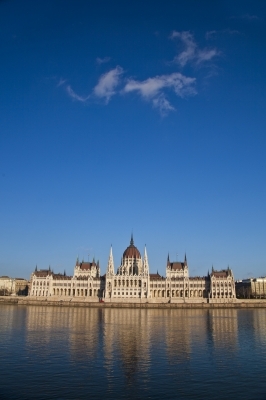 Walk around the Parliament or book a tour beforehand to learn more about Hungarian politics. Don’t forget to stop by St. Stephen’s Basilica for breathtaking views of the city. If you’re traveling through Hungary and need lodging find and book a place to stay in Budapest.